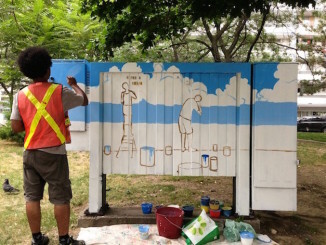 Last Tuesday saw the unveiling of yet another Toronto public art project in the Cabbagetown neighbourhood. 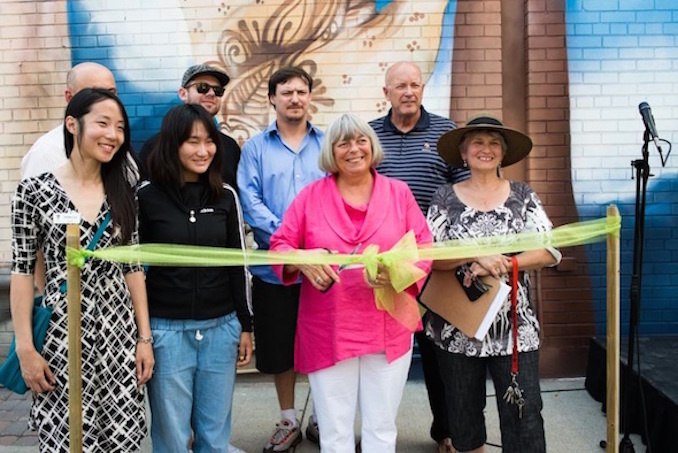 The non-for-profit organization Yonge Street Mission (YSM) hosted a gathering in the parking lot of their Double Take Thrift Store at 310 Gerrard Street E. to celebrate a mural of hope and community. 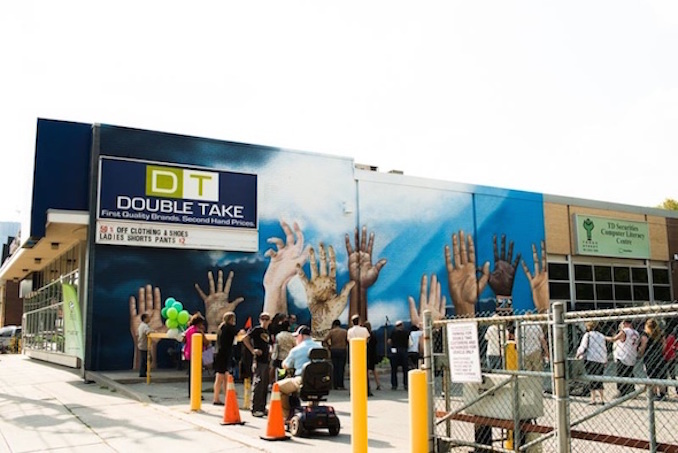 The mural, which was commissioned by Double Take store manager Kathy Webster, is titled “Hope in the City,” and depicts the hope of citizens who are living in poverty in Toronto. “We wanted to create something beautiful, something that the community would love, and something to convey what we’re doing here at Yonge Street Mission,” Webster said. 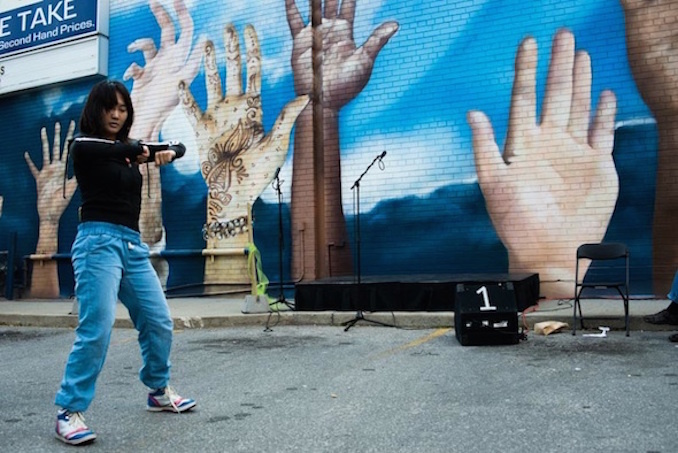 Locals and passersby in the Cabbagetown neighbourhood didn’t hesitate to join the celebration that offered free ice cream, face painting, a raffle, and entertainment from local dancer Fionna Gan and singer/songwriter Kaysun. City councillor for Toronto Centre-Rosedale, Pam McConnell, was also present to help cut the light green ribbon for the mural’s official reveal. 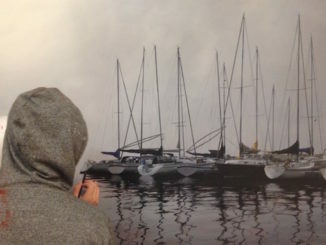 Earlier this year, Webster and YSM’s mission administrative officer Paul Davidson, sent out a call for mural submissions. Local artists, Ryan Dineen and Jason Rouleau submitted their design after hearing about the project from a friend. 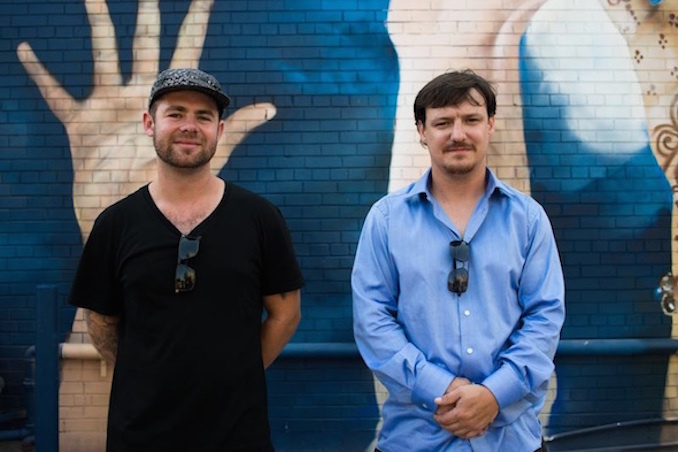 Luckily, the two were chosen to paint their portrayal of “Hope in the City” outside Double Take for the public to admire. The creative duo took to the stage last Tuesday to read their artist statement to the crowd. 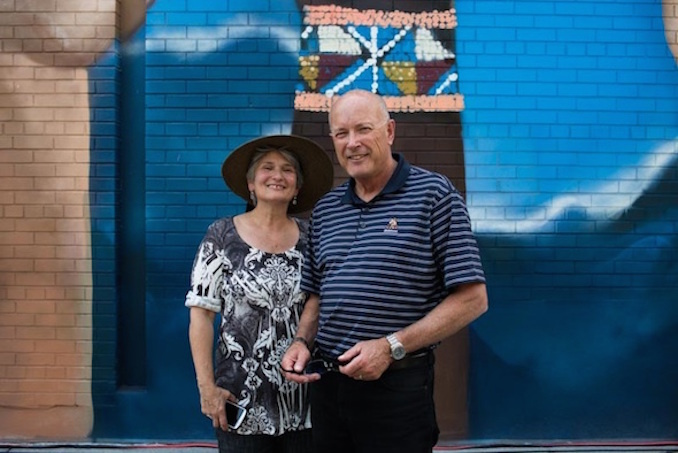 “The Toronto Muralists design, ‘Hope in the City,’ was created for the Double Take Store mural, as a reflection of the diverse community in which dedicated volunteers and community work together to serving and bring support to those in need,” Rouleau read. To learn more about Yonge Street Mission and “Hope in the City,” visit www.ysm.ca.